in ALL caps: What If I Can't See Toronto, Mildred? What If I Can't See Toronto, Mildred? I've been listening to the Canadian Adult Alternative station The Iceberg for a few weeks now, and it has lead me to the discovery of several pretty awesome artists. Not everyone they play on that station is Canadian. I discovered Colorado band The Lumineers via this station, in fact. But today, as the NXNE festival wraps, I am going to tell you about Matthew Good. And I suppose I should tell you about NXNE as well. Because of course you have heard about SXSW... The Austin festival which began 25 years ago to highlight the music scene but only took a handful of years to develop into a film and interactive conference as well. In all this time, South By Southwest has grown unbelievably and exponentially. North by Northeast, held in Toronto, has been going on almost 20 years but hasn't grown to the size of its southern counterpart. It is run completely on volunteer power. This year, the film, interactive, and music conference was held all in the same week and the music portion hosted approximately 780 artists. The majority were from Canada. 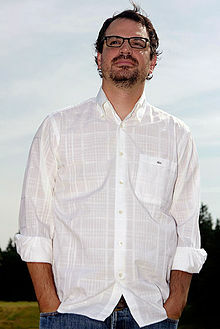 Like many of his American counterparts, Matthew Good struggled to deal with the band's success over the next 5 years and in 2002 he permanently dissolved the band. He launched his solo career the very next year with the album Avalanche. The new sound he intended to create was to contain more strings, and resemble folk more than the grunge that the band played. After turning down Juno award after award, his political activism poured out more and more. Not only did he proclaim that the Canadian award platform appeared to be simply a "marketing warehouse...for the United States", but much of his music directly pointed out the globalism forwarded by America. His second album was more political and more controversial. Since then he has continued his activism, his blogging, and his stand against Canada's Juno Awards. Although he would call it more simply speaking his mind rather than being an activist. I agree, MG. Speak your mind! His mind just happens to continue to remind people that the USA basically exists to promote military motives throughout the world. Never mind all that. The music and the lyrics that he has been writing for the last two decades are damn fine and poignant. Relevant. Speaking of which. Do you know who coined the phrase "First World Problems"? Yeah. You didn't know? I mean, this may already be the longest post I have ever written, and so far I've only shared with you a song from 1995... Oh, ho hum. First world problems. someone would love to have my first world problems - "Omissions of the Omen"
Here it is. Check out Matthew Good, check out the North by Northeast festival, and ask yourself what great music you're missing from Canada.